I’m having lunch with Yummy magazine’s restaurant critic, Danio Caw. I’ve always been curious about what would be like to be a professional food critic. It must be amazing fun: to dine at some of Manila’s finer restaurant, to eat to your heart’s (or stomach’s) content, to influence the dining habits of Manila’s eating public and best of all, to have someone else foot the bill. A truly heady experience, if there ever was one. I only occasionally get to have meals with foodies whose passion for food surpasses my own. Even more rare is to get the chance to sit down with a food lover who actually gets paid to write about his passion (or in Mr. Caw’s case, the dining experience in Metro Manila). 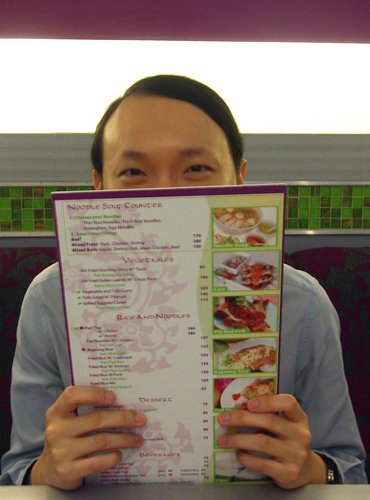 Today, Mr. Caw is visiting the first of three Thai restaurants, he will be writing about for future issue. He has been gracious enough to allow me tag along on his little food trip. In between spoonfuls of the usual Thai fare of shredded Catfish Salad and spicy Green Curry Chicken, I turn my focus toward the critic and understand writing food in the Philippines. How did you get started as Yummy’s resident restaurant critic? The Yummy Editorial staff knows that I love eating out. I seem to eat out more than them so they decided to give me the assignment. How do you chose the restaurants you review each month? Every month, my editor and I choose a theme for the three restaurants we are going to feature. Usually it is aligned with the theme of the issue. For the actual three restaurants, I recommend based on where I have eaten or from good reviews from my foodie friends. How do you write your restaurant reviews? What is your process? I go unannounced to the restaurant. This is the only way I can get a realistic service from them. I look through the menu and choose items which are interesting to me. Interesting meaning: the house specialty, an ingenious dish or something that a friend recommended. From there, the food tasting starts and notes are made for each dish. I make sure that I have at least three dishes that I like in the restaurant. Anything less would make a lean article. It is either I order more or if the food is bad, stop the review and do not include it in the list. I ask for the bill afterwards and pay it (charged to my magazine of course). It is only when my change has arrived that I ask for the contact number of the person my editor can talk to for shoot arrangements. I am never included in the shoot proper because the magazine protects my identity so that I would not be recognized when I do reviews in the future. I just recommend that items to be shot etc. What makes for an amazing dining experience? Great food speaks for itself but I always believe dining should not only be about the food served in the establishment. It is a combination of the ambiance and food. To be honest, I go back to a lot of restaurants where the food is not exceptional but the ambiance comforts me. Food service is another factor to consider. I like being treated like a queen and fushed about. I think it is one of the reasons why I am dining out and not cooking at home. What was your worst restaurant experience? A lot 🙂 but most of it involves really bad food service and not bad tasting food. I am amazed at how I can still manage to feel good after getting a so-so meal from a restaurant but still come back if the service given to me was great. At the end of the day, it is how I feel when I exit the restaurant. You will get me to come back if I have a positive vibe after. You talk a lot about the importance of service. How do you define great service? What restaurants come to mind. My greatest memory of excellent service are in two restaurants: Lemuria in Houseshoe Village and Aubergine in the Fort. When I say great service, I mean staff that are responsive to my needs and go beyond it. I hate having to call an attendants attention. (That’s why they are called food attendants. They should be in attention all the time:)) In the two restos I mentioned, they are always watching the table but always from a far. They know when when my glass is empty wihtout me asking for it. They know when to change courses. I also love service that explains the nuances of the food they serve. They should be knowledgeable. Don’t you just hate waiters who cannot answer your questions. When it comes to the food, what are you looking for in an excellent restaurant? I look for interesting dishes. “Interesting” meaning a twist to an old classic, a combination I have never seen before, a different way of cooking or a dish I have simply never tried before. Of course, everything has to taste good. For me, the best resto is Lolo Dad’s. Just the appetizer sampler alone can fulfill every craving. How important is ambiance to you and why? Any restaurants that stand out in this respect? I consider ambiance important because I think when you dine out, you’re looking for a “concept” and not just food alone. Food is part of the concept but that is not the only thing that will make your dining experience complete. There are exceptions though like those Chinese dimsum places where you just go to eat. But I prefer restaurants that make me feel good. Take for example, Uno. I love the olive green walls and interiors. Every time I am there, I am immediately relaxed which allows me to enjoy my food. Name your top five restaurant and tell us why they are on your list? This is hard:) (1) Lolo Dads: amazing food! for me, best resto in manila (2) Uno: best bread in manila, reliable food, menu changes quarterly so there is always something new for regulars like me, love the ambiance, boosts me up on my lonely days (3) Bellinis: orange cake, orange cake, orange cake (4) Terry’s: best Spanish resto for me, love the fabada, love the deli (5) CAV: I love the wine vendo machine (am a lover of red wine), great food. We noticed that you never write negative reviews. Why is that? Has there ever been a restaurant so bad that you chose not to write about it? Tell us about it. I am a very frank person and quite critical at times but I have to conform to the voice of the magazine. Yummy is a positive magazine and it would not fit into the editorial voice if there is a negative article. I think the best thing to do is not to include the particular restaurant in the article. Also, this allots for allowance to restaurants for days that just gone bad and not necessarily their fault. Yes, there are restaurants that I did not include but not because the food really tasted bad and needed to be reported to the BFAD. 🙂 Some restaurants are just not interesting enough to wirte about and the food was probably just normal. I think as a restaurant reviewer, you have to give your readers something new. Something they don’t know about yet. By the way, if you’re wondering what were Danio’s thoughts on Jatujak, you’ll have to wait a while. His feature will be in Yummy magazine’s October issue. Franco’s Note: For your information, I paid for my part of the meal. For better or for worse, I always pay my own way. Mr. Caw's job is totally awesome! I would love to be a mystery food critic here in HK. Imagine how much I'd balloon!!!!! Hahahahaha. By the way I will be in Manila next week, any resto suggestions? :) Sakai you are funny. Better memorize that 3rd part in case you open a resto and he comes strolling in!